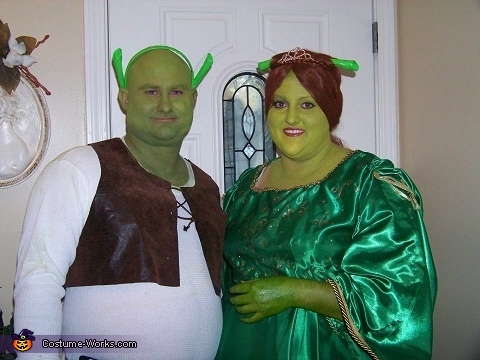 Robbie is Shrek and I am Fiona. We are both fat and who better to be than the most famous couple? It all started with some curtains from goodwill. I took the trim from the curtains and bought material and made my own costume. My husbands pants and shirt were also from goodwill and we made the ears from cardboard and lime duct-tape from home depot. My wig was from k-mart. OH MY GOSH YALL ARE SO CUTE! HIT THE NAIL RIGHT ON THE HEAD YOU 2. Love it hope y'all win!! !